This little Hoot represents the creative side in all of us. Set it in your window as a reminder to “Give a Hoot” to find solutions. Every week our artisan/crafters make little “hoots” in a variety colors depicting an array of personalities. Each is a one of a kind; hand built unique work of art using the authentic assembly techniques of European medieval leaded stained glass. Each measures about 3 inches wide and 4 inches high, attached to a wood block base suitable for display on your windows ledge. 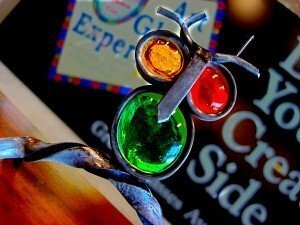 Make your own at the Art Glass Experience and discover your creative side.